Posted on March 18, 2019 March 18, 2019 Categories All! I have a couple ideas in mind. I couldn’t get the code to work but I’ll have more time to attend to it this coming week. I tried to run the code just looking at what’s returned in the SubjectHeadings.xml file. I might want to create a project that looks at the first time a subject heading was created, and the first object entered into the collection under that subject heading. Maybe I could bring in news headlines from that same time period. My question is – How does real life get into the collections? This seems like a big project. I’m not sure how it would turn out! I’d have to interview a librarian about Subject Headings to get a better sense of how they work. I was inspired by this LOC page, which lists all Subject Headings. The filter on the left seems to suggest LOC knows the general date for some, because I can look at only those made in the 2010s, for example. While I did inspect the contents of .xml Subject Heading files, I am not sure whether I am seeing records of Subject Headings, or records of objects in the collection? I’m pretty sure it’s the first thing, but it’s not clear. Either way, I want to know if LOC stores the year Subject Headings are created, and if not, how I might look for the earliest item in the collection for each subject heading. I struggled to get the code to work, see my error below. It must be something fairly simple that’s not connected in my code. I’m also curious how many people are in the LOC’s collections, but not in Wikipedia? It might be interesting to compare the two and see if there is any difference. I could limit it to a certain period of time, occupation, or gender. At the end, I might share the list with groups who get together to add entries to Wikipedia. I’d need to keep in mind that this idea is more about critiquing Wikipedia than the LOC. I could flip it, and see how many people on Wikipedia are not in the LOC. Along the lines of the last idea, I find it hard to critique the LOC’s holdings without comparing it to something outside it, which means bringing together two data sets. I’m interested in trying it but want to talk through what this looks like. Posted on March 6, 2019 March 6, 2019 Categories All! In larger projects where you want to scope as much as possible to prevent overusing variable and function names, you want to create objects that have functions inside of them. People on StackOverflow informally explain here that writing loose functions willy nilly is “90s”. More formally, Mozilla explains the many ways you can write objects and functions here. They say that a method is a function associated with an object. Said another way, methods are properties of objects. These special types of functions are defined the same ways as normal functions, except they have to be assigned as the property of an object. Below this example starts with the object’s name, the method name I want, and the function name I use for the method name. Posted on February 28, 2019 Categories All! To remind myself for all eternity how to add node.js to a project that will live remotely on a server, and not able to access the version of node.js that’s on my local computer. Why do I need it for my project? I also need node.js inside my local project because it’s going to live on a remote server, without access to my globally installed node.js on my computer. How do I add Node.js to a local project? I’ll use npm (or “node packaged models”) as a tool to install node.js into my local project. npm can install the node.js packages I need in local or global mode. In local mode it will install packages in a node_modules folder in my project’s parent working directory. Use this npm webpage to find the latest commands. But generally all I need to do is inside my project’s working directory in terminal, use $ npm install node.js ($ npm install <package_name>). Check NPM’s webpage here for the latest commands. Generally, first check that I have node and npm installed. To check if you have Node.js installed, run this command in your terminal. Note: This command checks whether node.js exists globally on your machine, not whether a copy is saved in your project folder that will exist on a remote server. I need both. How do I make sure I’m using a LTS version of Node.js ? Should I use a Node.js version manager? Is there a way to switch between versions of node and npm? How do I switch my project over to run forever? Posted on February 24, 2019 March 4, 2019 Categories All! With this guide, I am to explain to myself the higher level flow of how live streaming media, or audio in my case, is being sent by my project’s website from a speaker to a listener. What is Live Streaming Media? You are enjoying live streaming media in the browser. The technology that allows all of this is WebRTC… at least I think. Perhaps in some cases they aren’t using WebRTC? What kind of server do I need to use WebRTC? What does a Signaling Server do? A Signaling Server fulfills an essential function that the WebRTC API does not handle: getting two users connected in the first place. This type of server lets two users transfer initial introductory messages before they have access to a WebRTC peer connection. This type of communication is called signaling. Yes. The people who wrote the WebRTC APIs (there are three) decided to not handle initial connections, allowing others to set this part up exactly as you please. Do I really have to build it myself? Not literally. Actually, most examples I’ve found use the socket.io library to handle signaling for them. As will I! What are different options for setting up my Signaling Server? @Mauz, who I am forking super helpful code from his Web RTC Experiments github repos, has a helpful page about all of this. He suggests using either Socket.io/WebSockets (what I’ll use, like him), XMPP/SIP, PHP/MySQL, WebSync/SignalR, PeerServer/SignalMaster or other gateway. If people want, you can bypass socket.io and use your own signaling gateway/implementation. What kind of messages does my Signaling Server need to send? The bread and butter: the list below is taken from an article by HTML5Rocks. Session messages to begin or end communication. Media settings, such as video or audio, the formats to encode media with, bandwidth. Key data for secure connections (how does this work?). 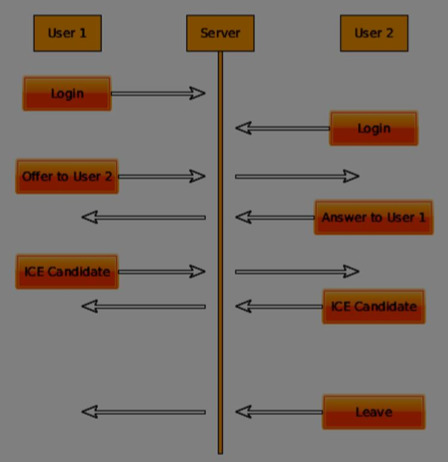 Once User 1 calls another User, the server needs to pass the offer from User 1, pass the answer from User 2, pass the ICE candidates (more soon) between them, and set up the WebRTC connection. Below is a nice infographic from Tutorials Point. A diagram showing communication patterns between User 1, a Server and User 2. Borrowed from Tutorials Point website. Not sure yet, do I need to know? What are STUN and TURN Servers? Not sure yet, but I might need to know… these servers apparently help users who can’t connect by the most direct route possible, and instead need to traverse NAT gateways and firewalls because direct connection fails. Are these reasons why my friends with AT&T couldn’t connect without local wifi outdoors in Washington Square Park? It looks like the WebRTC APIs use STUN servers to get the IP address of your computer (why?) and TURN servers to function as relay servers in case peer-to-peer servers fail. I started a guide for myself here. Posted on February 24, 2019 February 24, 2019 Categories All! My goal is to get my code accessible by anyone on the internet, yet prevent anyone else from knowing who visited my site, or seeing any data in transit from them to my server. I hope I can also prevent my visitors’ data from being saved on my server, or prevent my own server, with possibly their data on it, from getting hacked. Will HTTPS get me there? Ostensibly, yes. From my understanding, HTTPS is the first major step to prevent bad actors from eavesdropping, tampering, and message forgery on my site. To be honest, I don’t yet how “safe” HTTPs really is. Can I, the owner of the server, see who is visiting my HTTPS site? How can I not do this? How can I prevent others from hacking my server? Along these lines, I’ve read that people can modify HTTPS’ security parameters to their liking, which seems to defeat the purpose of consistent and safe browsing on the internet. Maybe it’s not as much modification as it first sounds like. But I need to find out what kinds of security parameters I will add to my site. Generally, though, HTTPS is the accepted standard. Even Google Chrome wants me to know which sites are secure or not. Interestingly, my WordPress editing page is not secure. HTTP is a protocol that sends data between a visitor’s browser and a website. (HTTPS stands for Hyper Text Transfer Protocol). HTTP fetches resources to show on your browser when you visit sites. Adding an S on the end signifies the protocol is secure (Hyper Text Transfer Protocol Secure). HTTPS is secure because it uses additional protocols, most commonly TLS (Transfer Layer Security), to apply encryption to the client’s data. TLS offers authentication, encryption, and integrity. It confirms the identity of the server and user. It encrypts any data passed back and forth. And it ensures the data is not lost along the way. How does HTTPS/TLS check for identity? HTTPS/TLS helps your browser check a website’s server’s digital certificate to see if it was issued by a trusted organization (important because otherwise anyone can create a certificate claiming to be whatever website they want). The certificate is used to confirm identity. Specifically, a digital certificate is a data file that links a private cryptographic key to an organization. To modify your server’s configuration of TLS, Mozilla recommends using newest cryptographic tools available for the browsers you want to connect to your site. There are basically three options, each allowing you to work with older and older browsers if needed. Once you use a configurator tool like Mozilla’s to find a TLS set up that’s best for your visitors, it looks like you enter the provided TLS text inside an appropriate file on your server and restart the server. You need to review the new TLS text in your file to add correct domain names. The ‘Moving to HTTPS Guide‘ is a good overview & how-to for switching over. … Or at least the Mozilla Foundation recommends it, and I trust Mozilla! You can find the actual configuration options and associated code at Mozilla’s configurator tool here. I’m unclear if using CertBot’s command-line level application to get a HTTPS key and certificate removes the need to use Mozilla’s TLS configurator tool above? Or do I also need the TLS protocol text provided by Mozilla? Mozilla Foundation’s webpages on TLS, HTTP (or how a lot of the internet works, and specifically HTTPS. Cookies – I don’t need cookies since my visitors won’t be logging in and want anything saved for later (requires cookies to remember state information for the stateless HTTP protocol), and I don’t want to save or analyze my visitors behavior. Web Analytics – Do I want to know how many people visit the site? Can I accomplish this without google analytics? Posted on February 23, 2019 February 23, 2019 Categories All! Here is the slide deck for my precision rectifier circuit, which helps track whether an appliance is on or off.